Inspired by the dynamic Prairie Landscape, the pieces in this collection are designed to bring a little rugged, free-spirit to an urban wardrobe. Feathered fibers, natural gemstones in a variety of textures, tough leather, patinated metals, and rustic handmade focals combine to create polished pieces with a primitive edge. A beautifully handmade polymer focal by Humblebeads features windswept willows, and takes center stage for this necklace. 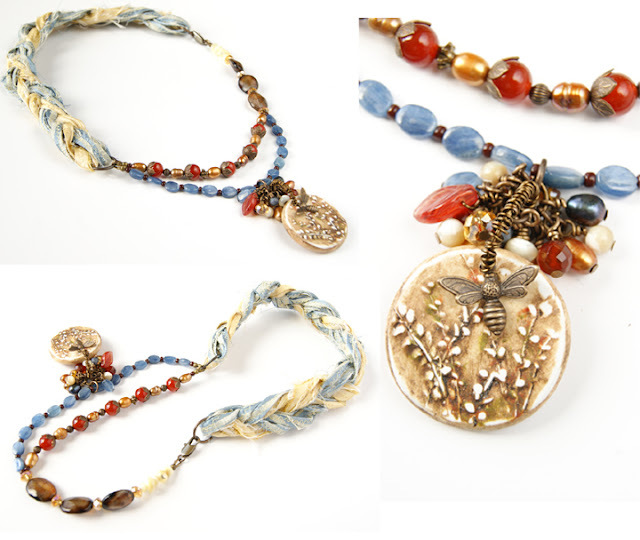 A small Vintaj Bee charm hovers playfully over the painted willows and is complemented by a cluster of swinging, hand-wrapped dangles of Pearls, Carnelian, Kyanite, Czech Glass, River Shell, and Crystals. A strand of beautiful blue Kyanite, spaced with Oxblood seed beads, hangs below a strand of Gold Pearls and Carnelian rounds with elegant Vintaj Foliage bead caps and Vintaj Corrugated Melon beads. 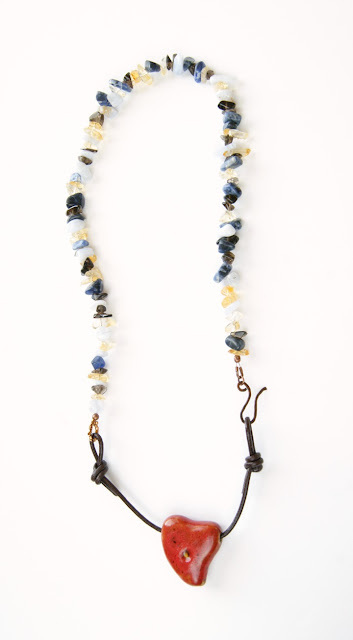 The two strands join to form one strand of Rainbow Snakeskin Agate, Topaz Glass Crystals, and White River Shell Nuggets. 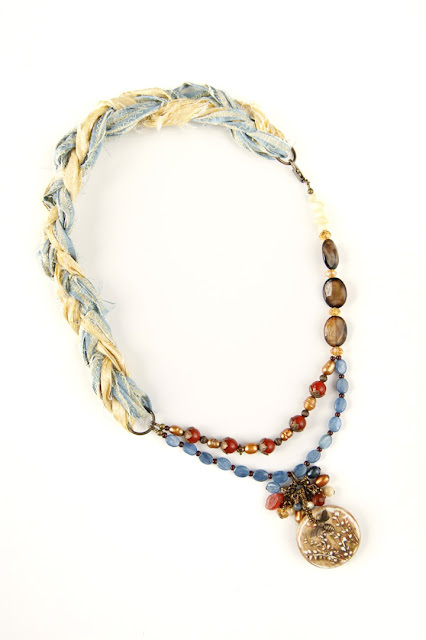 Completing the necklace is a braided strand of silk fibers in Straw and Cornflower Blue. These are finished with large Vintaj Brass jump rings, and a Vintaj Lobster Clasp. The Matinee length necklace measures 22 inches long, and has a drape of 14 inches from the back of the neck to the bottom of the focal. These earrings are designed to coordinate perfectly with the "Irreverent Willows" necklace. They are simple, yet elegant and would be an easy addition to any look. 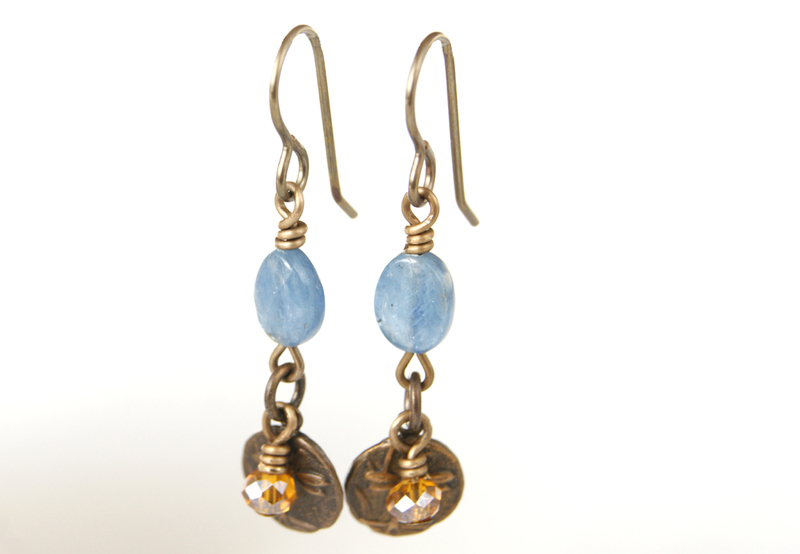 Featuring hand-wrapped dangles of Kyanite, Pearls, Czech Glass, River Shell, and Crystal, these earrings will swing and shimmer beautifully. The earrings are finished with Vintaj Brass components and ear wires, and have a 1 1/2 inch drop. These lovely earrings feature shimmering blue Kyanite ovals, all Vintaj Brass components and ear wires, and sweet drops of Topaz Glass Crystal. The brass disc charms illustrate dragonflies buzzing about willows and grasses. These earrings coordinate with the "Irreverent Willows" necklace, and have a 1 1/2 inch drop. "My Prairie Heart" is a simple, yet stunning, necklace. 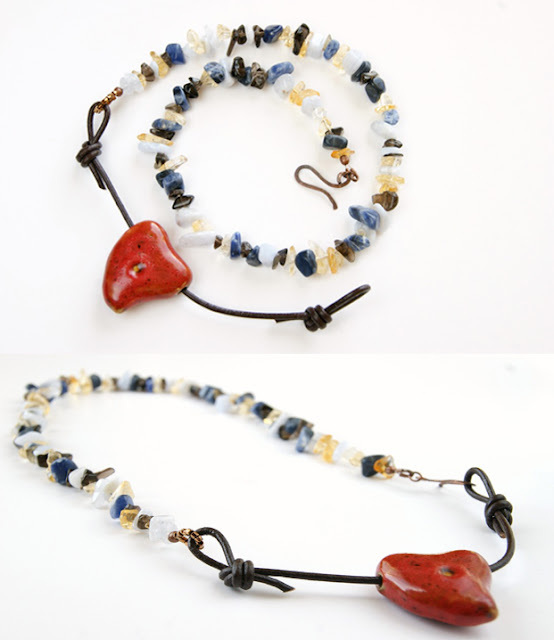 Gemstone chips of Sodalite, Blue Agate, Citrine, and Smoky Quartz compose the back of the piece, and a rustic Red Ceramic Heart focal hangs from Chocolate leather cord in the front. Copper components and hook clasp complete the piece. This Princess length necklace measures 19 inches long, and has a drape of 12 inches from the back of the neck to the bottom of the Heart focal. 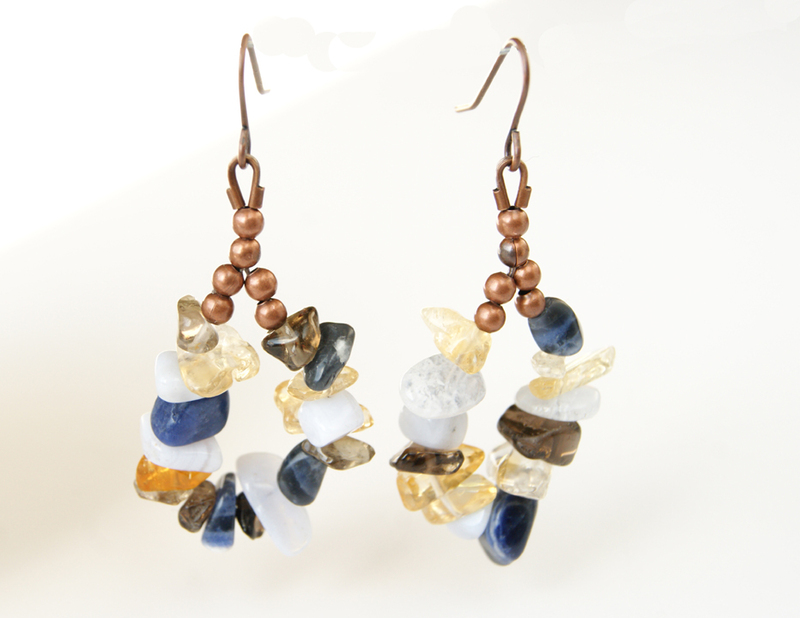 Coordinating with "My Prairie Heart" necklace, these earrings also feature Gemstone chips of Sodalite, Blue Agate, Citrine, and Smoky Quartz. 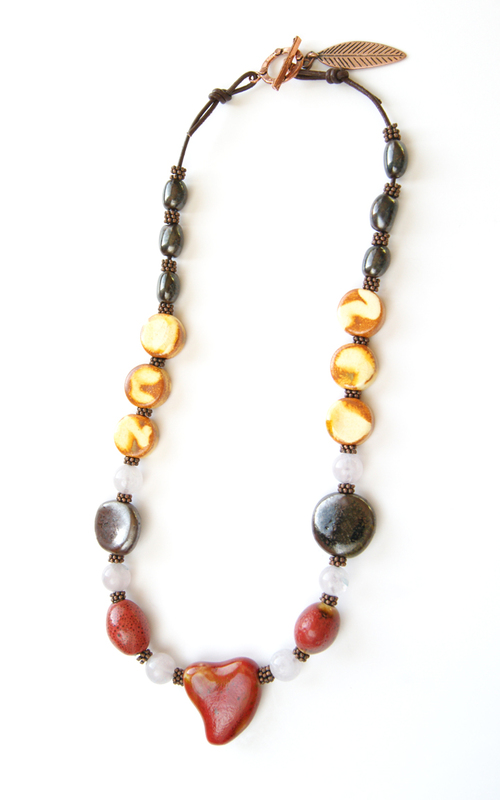 The stones are strung with bead wire to create asymmetric, free-form loops. The earrings are finished with Copper components and ear wires, and have a 2 1/4 inch drop. Add an artful look to your outfit with this beautiful necklace, featuring colorful ceramic beads, including handmade beads by Mary Ann Carroll. 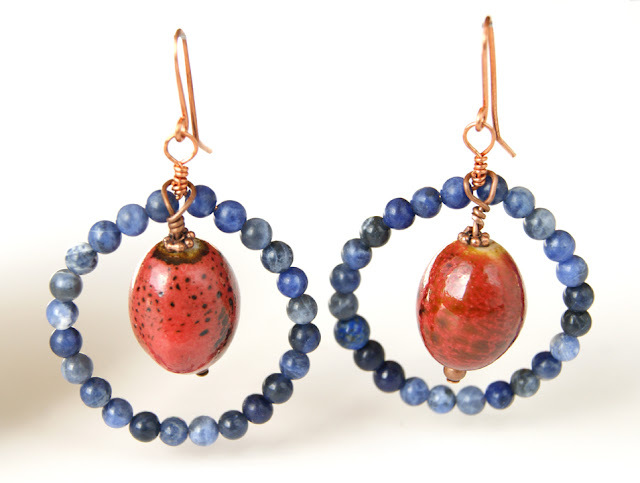 A Red Ceramic Heart focal, and coordinating Red Ceramic ovals, are complimented by Blue Glass rounds, Mottled Gold Ceramic discs, and gorgeous Speckled Chocolate and Copper disc and oval ceramic beads by Mary Ann Carroll. Strung on supple Chocolate leather cord, the piece is finished with Copper Daisy spacers, a TierraCast Copper toggle clasp, and whimsical Copper Feather. This Princess length necklace measures 20 inches long, and has a drape of 11 inches from the back clasp to the bottom of the Heart focal. This bracelet will wrap her wrist in rustic charm. Featuring a brilliant Red Ceramic disc with a Copper Heart charm, this bracelet also has Mottled Gold Ceramic discs, Fluted Copper Rounds, and unique Cream and Black Nut beads, and coordinates with the "Heart Canyon" necklace. These are all hand-knotted on beautiful Chocolate leather cord and finished with a hammered Copper hook clasp. 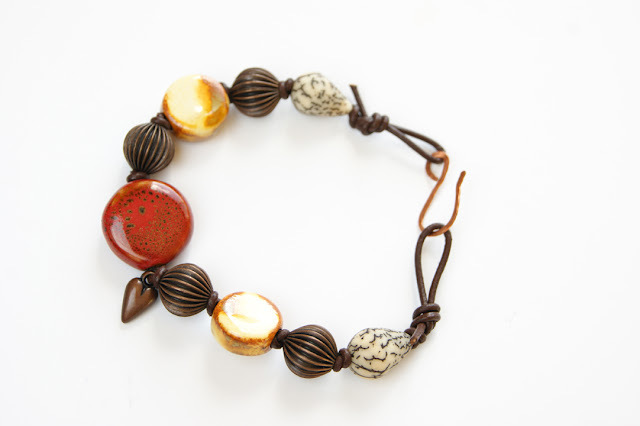 The bracelet is not adjustable, but is generously sized and measures 8 1/2 inches long. These bold earrings feature large Red Ceramic Oval beads hanging within hoops of 4mm Sodalite rounds. Designed to coordinate with the "Heart Canyon" necklace, they will add a little Western flair to her wardrobe. 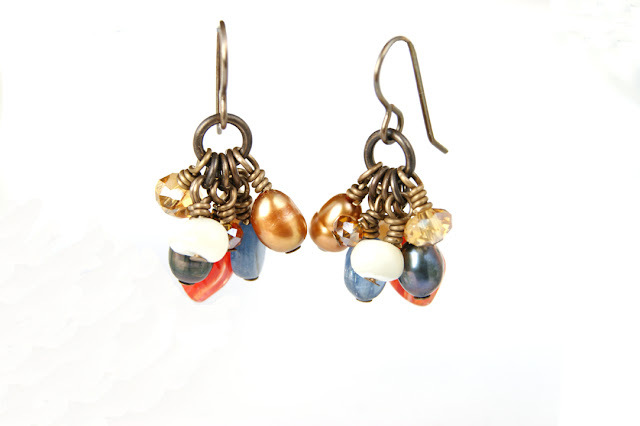 The earrings have all Copper components, including wire, ear wires and accent beads. They have a 2 1/4" drop. 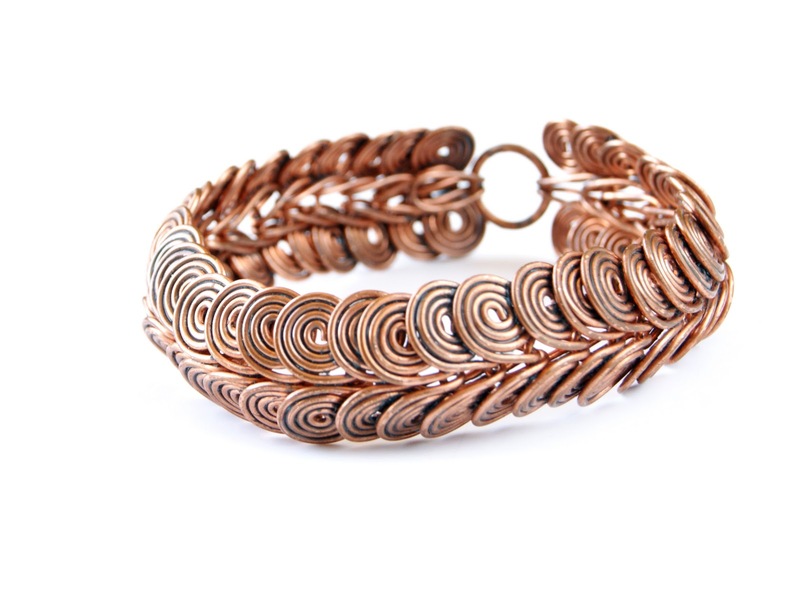 Meticulously crafted out of Copper wire, this gorgeous and versatile bracelet will be a unique addition to any jewelry wardrobe. The rich patinated Copper is a warm color that looks beautiful on all skin tones, and coordinates well with many colors. 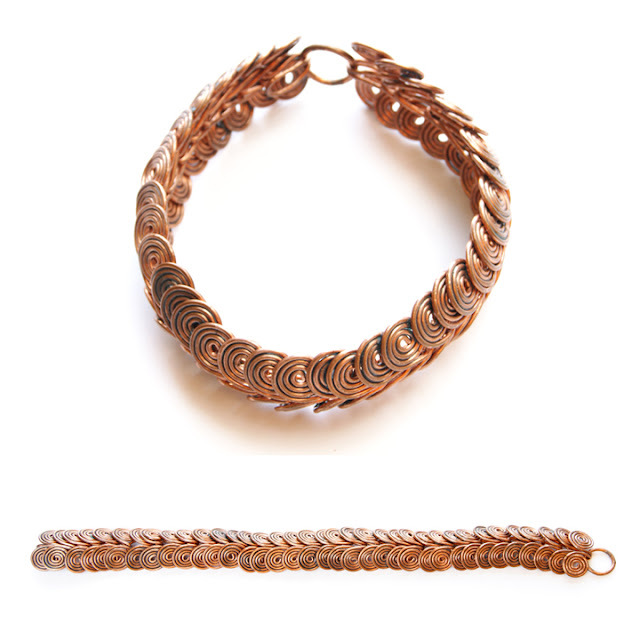 Thirty-six links of double spirals are joined together to create a fluid chain bangle. The bracelet is not adjustable, and measures 8 1/2 inches long and 1 inch wide. The Copper has a slight patina, and has been sealed to prevent further coloration. 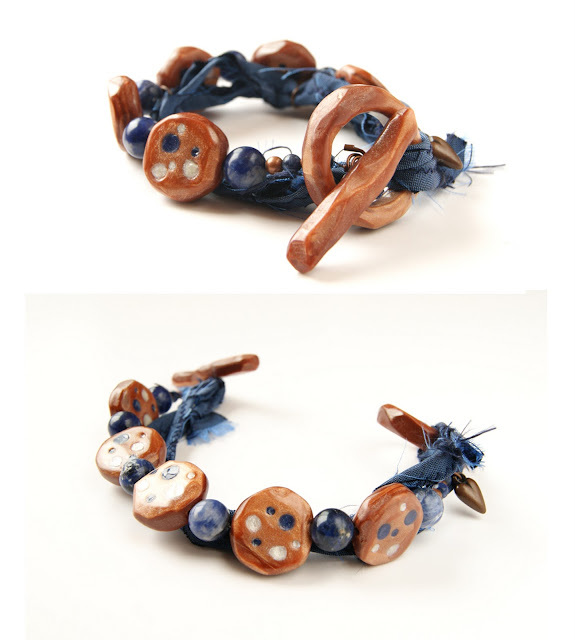 This artisanal bracelet features handmade Polymer Clay beads and Toggle Clasp by Erin Fickert-Rowland. Using the Mica Shift Technique, these components have been crafted to look like faceted, shimmering stone elements, yet are extremely light in weight. The beads have been cured twice, and back-filled with White and Blue Pearlescent clay. 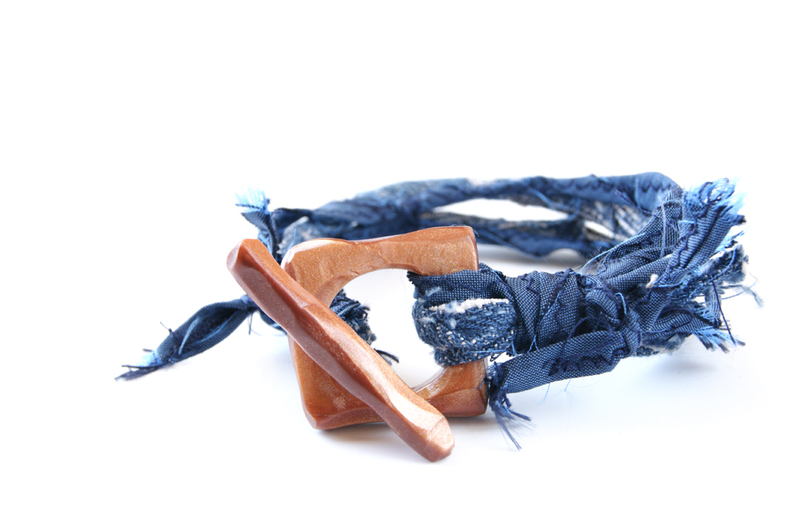 The large chunky Toggle Clasp is extremely easy to use and makes a stunning focal for the bracelet. The handmade beads are complemented with 10mm Sodalite rounds, 4mm Copper and Sodalite rounds, a whimsical Copper Heart Charm, and deep Blue Silk Fibers. The bracelet is not adjustable, but is generously sized, and measures 9 inches long. These earrings combine natural Gemstones of Sodalite and Carnelian, with stamped Copper beads and sparkling Topaz Glass Crystals to create a set that will be elegant and versatile. 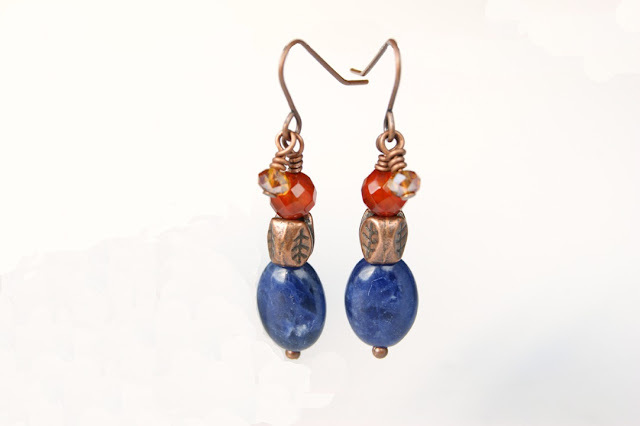 Copper components and ear wires complete the earrings, which have a 1 1/2 inch drop. 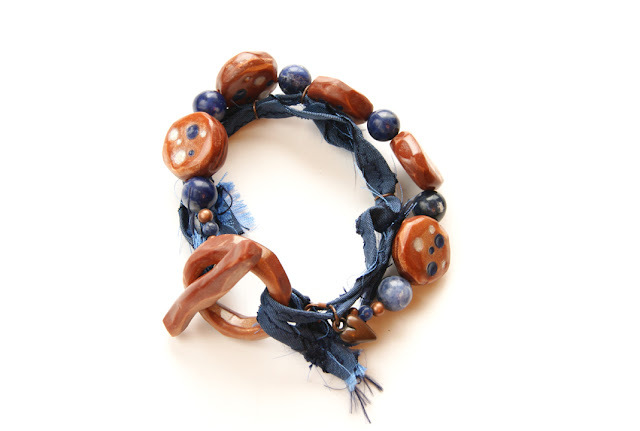 This fun and funky bracelet will add an artsy, casual vibe to your look. A beautiful handmade Polymer Clay Square Toggle Clasp by Erin Fickert-Rowland is the focal of this piece. The Mica Shift Technique has been used to create a piece that resembles faceted, shimmering stone, yet is extremely light weight. 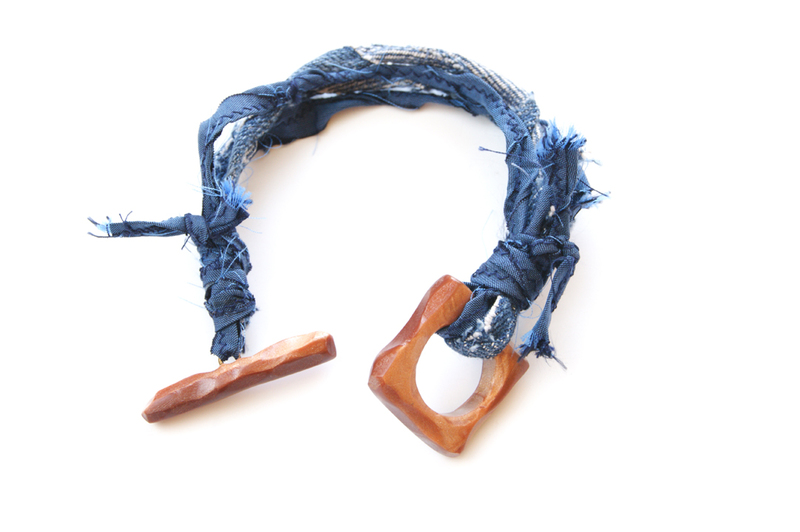 The clasp is very easy to use, and is joined by soft fibers in rich Blue Silk and Denim. The bracelet is not adjustable, but is generously sized, and measures 8 3/4 inches in length. i do not even know what to say...this line is superb! edgy and earthy all at the same time. so much to say on each piece, but for just now a comment on two. the "my prairie heart"--the cord looks like barbed wire. i love the idea of the heart in/on/surrounded by barbed wire. fantastic! and the polymer toggles on the bracelets!!! i was at a bead show today and saw a friend who teaches polymer techniques and told her about a blog i saw on the hop that had polymer toggles and how i wanted to try it. and here you are with them and they look wonderful! Beautiful beautiful collection, Erin! I really like the way you photograph your gorgeous pieces! You combine fibers, gems , wire and focals so skillfully and I am very impressed with your wirework - that Copper Spirals Bracelet is fabulous!! I have always loved Egyptian coils . Thank you so very much Christine and Geanina! I am so happy you like the pieces! I really love the Heart Canyon necklace and how it was handmade by Mary. 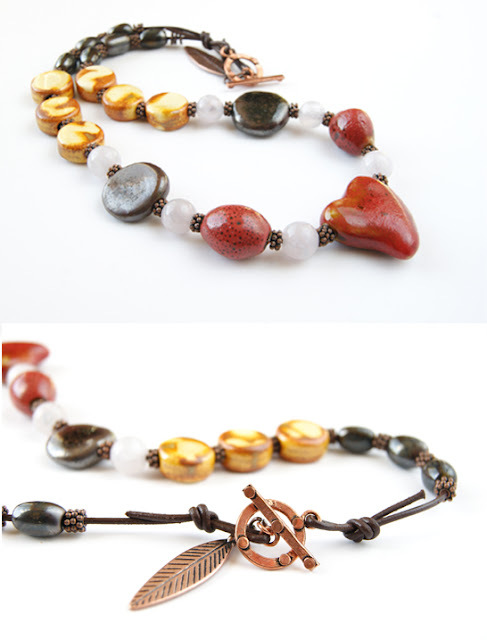 The colorful ceramic beads are just too gorgeous and specially the whimsical Copper Feather is so attractive. I am also making any kind of jewelries and my goal is to make a product not just to suit the outfits of my customers but just looking at my jewelry they will be stunned and it can capture their hearts. Like what the blog did to me. Thanks for sharing this inspiring blog Erin.